Life has graced us all with moments that just plain hurt. I have been learning through the past six months that I have a choice: do I want to heal, or not? Because of all of my hip surgeries, I can relate well to the intense process that is called healing. But, the next day you walk a bit further… then you get to go home. A walker is necessary for a while because you are too weak to balance on your own. Once you’re stronger, then come crutches. When there is a hole permanently burned into your armpit from the dad-gum crutches, you get a cane. All the while attending ridiculously painful therapy sessions. While painful and unpleasant, it is a necessary process by which the healing will occur in the weak places of your body. Over time, muscles develop and the pain lessens. The healing of my heart is following such a pattern. Leaving all comforts and security behind, I followed the Lord's lead and moved to Pennsylvania. This was my crutch moment. It had only been five months from the unexpected blow that left my heart in intensive care. Another month later, and my armpits are sore… it is time to move to a cane. Working for Dannah Gresh has been an experience I can hardly put into words. The author of And The Bride Wore White, the book that saved my purity and ultimately my life, has challenged me to grow spiritually as well as take steps toward forgiveness, which will bring about my ultimate healing. I have shared my heart, my struggles, and the deep wounds left by someone I once loved and trusted. Each time, more pain is brought to the surface and is able to be burned off. However, this week I faced a new challenge…. 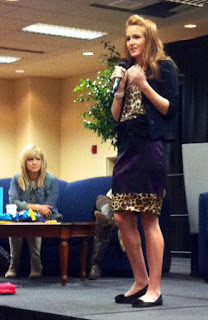 Dannah asked me to go with her to the True Woman Convention in Indianapolis next week! I was thrilled! Then I got my pre-convo assignments. 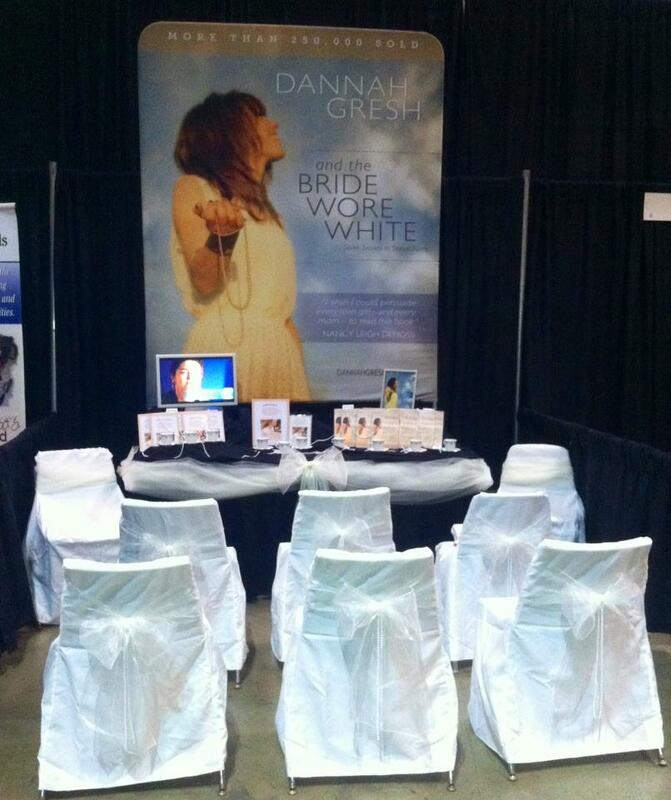 While we are in Indy, we will be promoting her newly revised book, And The Bride Wore White. We will have our own booth in which we can talk to women about the powerful message of the text. 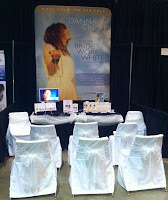 The table in our booth is to resemble that of a bride and groom's wedding reception table. No coincidence I’m sure, this table just so happens to look almost identical to the one I was to share with my groom on June 2. The process of shopping for and decorating a wedding table has been far from pleasant. Since I have been in PA, I have put on the “tough” face (imagine that!). I haven’t let myself cry or hurt… tying ivory bows and pearls onto chairs caused feelings and emotions to rush to the surface and I lost it - finally. Sometimes God calls us to go to bat with the things that are taunting us; the things we try so hard to ignore. David took a stand and faced Goliath while everyone else tried to pretend he wasn’t there. My Goliath is an ivory wedding table - and I am conquering it. Never in my wildest dreams did I image that seven months later I would be standing on a stage sharing my deepest hurt with teenage girls. The rawness is good. The pain is good. The lack of closure is good. This helps me know those faith muscles are working and healing is coming. So, no matter how daunting or difficult it seems, I challenge you this week to go to bat with your Goliath. Face it head on! I will proudly go set up a wedding table at this convention knowing that Jesus is my groom and that He saved me from something He knew would have caused even more hurt. Once your Goliath is conquered, you will likely be sore, tired, and have bloody hands and dirty clothes. This is good! You can come back from your battle with raw experience and tell others of the great victory you achieved provided by none other than the Lord Himself! So, while I have no idea what I am going to say to a room of four hundred teenage girls, I know God will provide the words. The rawness and the pain and tears this week will bring forth a harvest next week – I am sure of it. When we are face to face with our weakness and our pain, I believe God is able to create a transparency to which others will gravitate. I appreciate prayers for humility and gentleness as I continue to strive to honor this young man’s reputation. Ask that the Lord would give me the words to speak and that He would uproot any and all bitterness in my heart. Honestly, the truth is, I am still angry, devastated, struggling with rejection and am trying to move toward forgiveness. I even considered becoming a nun…. I don't know what the "Truth About Relationships" is! 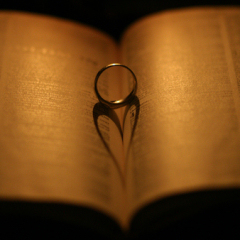 I just know that the only One who will never disappoint me; who will ALWAYS love me and consider me His Bride is JESUS. Maybe, it is those very human struggles and real emotions that make us relatable to others. Embrace your pain and allow Jehovah Rophi not only work a miracle of healing in your own heart, but watch and be amazed as He draws others closer to Him as a result of your vulnerability.